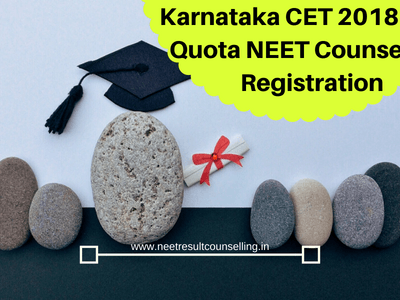 Karnataka CET 2018 State Quota NEET Counselling Registration Schedule Date: The Directorate of Medical Education, Karnataka is conducting counselling for Medical & Dental Seats to be allotted under CET 2018 quota only. All candidates who have successfully qualified NEET 2018 exam, are eligible to participate in State quota counselling. Recently, Karnataka Examinations Authority has published NEET state quota counselling information Brochure 2018 on their official website. All eligible candidates are called to fill the online registration form and document verification. The counselling will be conducted for all medical courses like MBBS, BDS, B.Pharma, and M.Pharma. Complete state quota counselling schedule is available below. All candidates of Karnataka are suggested to keep their eagle eyes on this website as well as on official website of Karnataka CET to get all updates. Update 16/06/2018: Karnataka Examination Authority announced NEET State Quota Counselling 2018 Information Brochure. Now, Candidates can fill the registration form from 15th to 21st June 2018. 1)Admit card of NEET UG 2018. 2) NEET – UG 2018 Mark sheet / Rank Card. 3) A Copy of Online Application Form for participation in COMEDK counselling pursuant to NEET results. 4) SSC (or equivalent) passing certificate or any other Government document as proof of Date of Birth. 5) PUC/12th std. (or equivalent) examination marks sheet. 6) Applicable Caste Certificate issued by the Competent Authority (for Karnataka Candidates only). 7) OBC certificate issued by the competent Authority (for Karnataka Candidates only). 8) Minority certificate issued by the educational institution concerned (for Christian, Tulu and Telugu Minority of Karnataka and Non-Karnataka Christian candidates). 9) Domicile certificate, wherever necessary (for Karnataka Candidates only). 10) Parent domicile certificate, wherever necessary (for Karnataka Candidates only). 11) Eligibility Certificate for claiming seats reserved for Hyderabad Karnataka Region candidates issued by the Assistant Commissioner of the respective sub-division (applicable for Karnataka Candidates only). can candidates of other states (like uttar pradesh, uttrakhand) apply for karnataka neet 2016 state counselling ? Do i need to apply again for counselling? I born in Karnataka and all my studies from LKG to 12 standard done in Bangalore, Karnataka. My question is, Do I need to produce Domicile certificate at the time of counseling? Also my parents are born and residing in Karnataka. If I won’t get good marks in kcet but if I get good marks in neet can i participate in counselling? when will the online application form will open for NEET 2017 counselling online registration for Karnataka ? Soon after the declaration of NEET Result 2017.
when will u announce neet results? I got 39000 sc category rank will i get college across India plz suggest me the process to it. As I belong to karnataka state. Sir, I am from Assam. Can’t I apply for medical colleges through neet 2017 of Karnataka through KEA counseling . Hi…I got 201 marks in neet 2017 ..I can get any medical colleges or bds college in Karnataka? Sir i got 301marks in neet 2017. Can I get M BBS government seat in Karnataka. The NEET 2017 Karnataka State Ranking ! When ???? is a big question mark among NEET Aspirants of Karnataka Domicile students. The eagerness, anxiety etc the officials not knowing so they are not bothered. Once you pay money to engineering admissions and after than if you get again has to pay fees to Medical. See how a common man can manage it?. Please announce the neet karnataka 2017 ranking and start admissions procedures. When will be the registration starts for management quota seats in comedk?? I have given choice 1 instead of selecting choice 2 as I need to participate in the medical/dental seat allotment by KEA holding my engineering seat., Please advise whether I am able participate for option entry in NEET for medical…. Hii I got 1167 state rank in neet2017.Is there any chance for me to get govt seat in Karnataka. I want to modify my information in neet application form..as my caste information s entered wrong ..
my neet 2017 rank is 14000 ,can I get free dental seat in Karnataka? plzzzzz reply…. I would like to know the counselling dates for Neet 85•/• state quota seats in karnataka. And can you please tell me the link through which i can login. I am from Kerala. DO NOT HAVE nativity for Karnataka. My NEET All India rank is 16600. How can I obtain a seat in Karnataka even if it is a management seat? Sir whats the counselling date for non-karnataka ? I am expecting below 300 marks in neet 2018. Can I get a government medical seat in Karnataka. I belong to religious minority category. Kindly tell me what is the minimum marks of neet to avail a government medical seat. I got 22000 rank in ST category in NEET 2018.Will I get a medical seat in Karnataka? Sir I got 311 marks in neet can I get govt seat in karnataka?? Pratibha, You have scored very low. It’s hard to say anything. I would suggest you to take part in your state quota counselling. What is your AIQ rank? Sir I had got 300 marks under OBC category in neet 2018 will i get seat to medical. I am from karnataka and have got 239 marks in neet, category OBC rank 117514 percentile 77.985. what are the chances. My brother gave NEET exam this year. And he scored 91.22 parcentile. Is he eligible for any Karnataka Medical College? And can you please share the procedure of how he can apply if he is eligible for Karnataka Medical Colleges? Sir i have scored 326 in neet .i belong to st category, will i be able to get a medical seat in Bangalore ? How can I check my statewise neet result and Should i have to fill the NEETcounselling form again? If yes where? Yes, In order to know state rank you have to fill state quota counselling registration form. For Karnataka state check in article. Nisarg, 321 is not enough, You should try state quota counselling. Sir i have got 247/720 and i belong to obc category and telugu minority in state quota counseling for my marks which colleges i have to select sir. Sir i. Have got 350 marks n i m in obc wl i get a seat all over india ?? Sir myself nikita.I belong to delhi and my category is general.I got 323 marks in meet 2018.sir pls tell me whether I am eligible to take part in Karnataka state counselling to get a MBBS seat in any private college. You are eligible to take part in Karnataka state counselling. My name is Divya Bharathi. I am from Andhra Pradesh. Please let me know am I eligible to participate in Karnataka state counselling. If yes, please let me know the process. i studied in tamil nadu but my mother tongue is kannada.can i trake part in karnataka state counselling and my marks is 321. please relpy ASAP. sir,i have secured 262 marks in neet belongs to obc and rural background will i get govt ayurvedic collage. is there anything like management quota in the private medical colleges in karnataka? Sir, plz inform the correct dates for online registration to attend the neet 2018 Karnataka state counselling. plz reply quickly. I have taken comed-k and I have scored 48000 rank when I enquired comed-k about medical seats they replied medical seats are not being alloted through comed-k results but in your website you have mentioned that you will be providing medical seats through comed-k also, please clarify whether they will be alloting medical seats or not. I belong from U.P. Can i do councelling in karnataka. When they will release karnataka state rankings???? ?